Melanoma is a type of skin cancer, and is marked by changes in the appearance of a region of the skin. As they develop on the skin, there’s a better chance of early detection and cure. 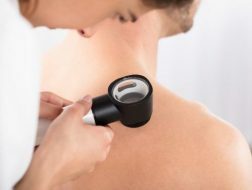 Signs of melanoma include changes in the shape, color or size of an existing mole; generally, moles are harmless – they are small and evenly colored and remain the same over time. However, if it becomes larger or there is some discoloration, it could be an indication of melanoma. Any unusual skin growths apart from moles that seem to change in size, color, texture etc. Though melanomas usually develop in the regions of the skin that are usually exposed to the skin, they may also develop between the toes, underneath nails, on the palms and soles, genital, and even the eyes. Exposure to the sun’s UV rays and other UV light (tanning beds) is the chief risk factor for melanoma. The higher the exposure to UV light, the greater the risk of melanoma; children who have sunburns can have increased risk of melanoma in adulthood; people who spend a lot of time outdoors for work or leisure, and even sportspersons, are all at a greater risk of melanoma. However, melanoma can also develop on parts of the skin not exposed to sunlight like armpits, groin, and so on. 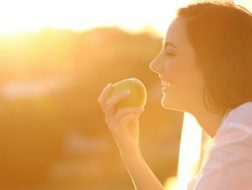 You can bring down your risk of melanoma by controlling factors you can. For example – do not get into tanning beds, and limit your exposure to direct sunlight, especially at mid-day. Get regular skin examinations performed, as there could be many factors that cause melanoma that are not under your control. The risk of melanoma increases with age, though it can affect people of all ages. People above the age of 55 are at the most risk; it is also common in women aged 25-30. Infections, viruses, and diseases that weaken the immune system, and immune suppression therapy after organ transplant are all risk factors for melanoma. Caucasians are at a higher risk of developing melanoma, especially those with blonde or auburn hair, blue or green eyes, and those whose skin develops burns or freckles easily. Most moles are harmless and remain benign lifelong; however, having several moles on the body could indicate a heightened risk of developing melanoma. Individuals with dysplastic nevi, or moles that look like melanoma, are also at a higher risk for melanoma. It is not necessary that all dysplastic nevi will develop into melanomas; however, if you have such moles you need to consult a dermatologist and get a thorough skin examination performed. If either or both of your parents or siblings had melanoma, you are at increased risk; if you were diagnosed with it any time previously, you may develop it again. A condition called xeroderma pigmentosum is passed on genetically; this disease inhibits the skin to repair itself when it gets damaged due to UV exposure. Such individuals are also at a greater risk of developing this cancer. Melanoma is the most dangerous skin cancer, and the fifth most common type of any cancer. 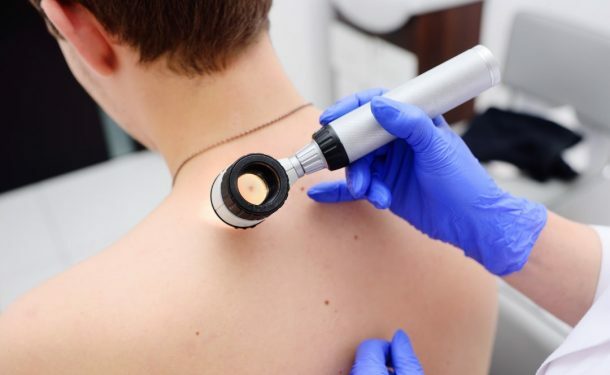 After a thorough skin examination and a few tests, the oncologist will conduct a thorough evaluation of your melanoma and chart out a comprehensive plan of treatment. Treatment includes medication, radiation, surgery, and supportive care to minimize side effects. If detected early enough, melanoma can be operated upon; the patient is administered local anesthesia, and the tumor, along with some healthy tissue (margin to be safe) is removed surgically. However if the melanoma cells have metastasized to distant areas in the body, or the lymph nodes, surgery alone will not suffice. A combination of treatments may be deployed to combat the cancer. This could include immunotherapy which includes stimulation of the immune system to destroy cancer cells. Targeted therapy is another new technique that has emerged in the fight against melanoma. This treatment includes the identification of genetic defects or mutations in the melanomas; drugs that target those specific mutations are administered, preventing the melanoma cells from growing.